Map 1. 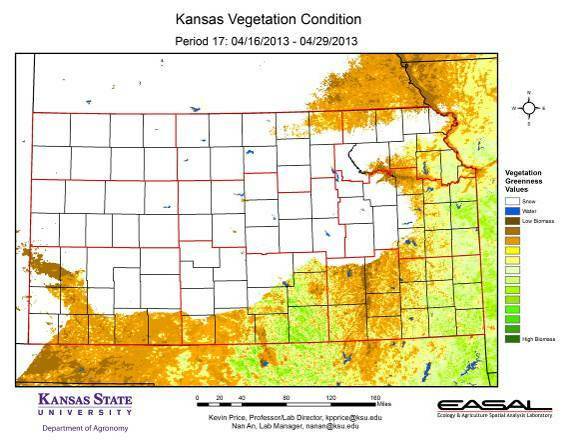 The Vegetation Condition Report for Kansas for April 16 – 29 from K-State’s Ecology and Agriculture Spatial Analysis Laboratory shows that snow continues to be a feature across much of the state. This is the latest the snow mask has been maintained since the Vegetation Condition Report has been produced. The snow mask will likely continue next week to reflect the snow received in the last few days. Map 2. 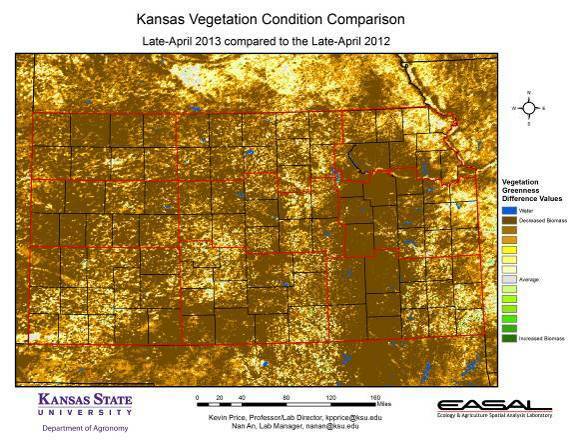 Compared to the previous year at this time for Kansas, the current Vegetation Condition Report for September April 16 – 29 from K-State’s Ecology and Agriculture Spatial Analysis Laboratory shows that statewide biomass production is much below last year. In the Flint Hills, this is particularly noticeable. Growth of the grasses has be greatly delayed. Map 3. 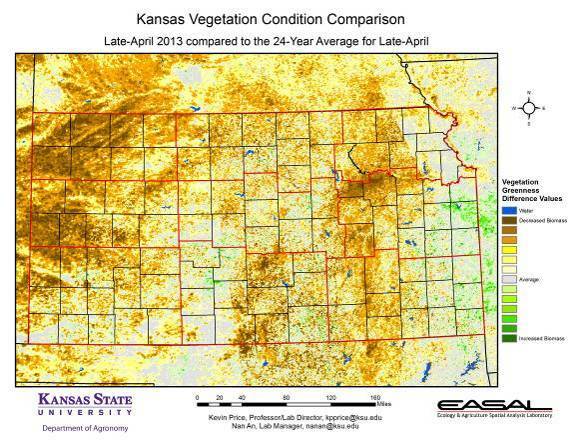 Compared to the 24-year average at this time for Kansas, this year’s Vegetation Condition Report for April 16 – 29 from K-State’s Ecology and Agriculture Spatial Analysis Laboratory shows that some areas have slightly above-average photosynthetic activity. This is most noticeable in the eastern-most areas of the state, where temperatures have not been quite as cold and where moisture has been more favorable. In western Kansas, much of the region shows below-average productivity. In southwest Kansas, the impacts of the mid-April freeze are being seen in reduced photosynthetic activity. Map 4. 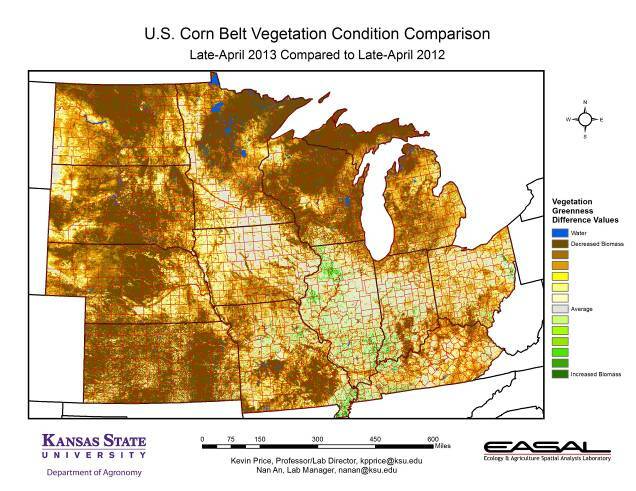 The Vegetation Condition Report for the Corn Belt for April 16 – 29 from K-State’s Ecology and Agriculture Spatial Analysis Laboratory shows that snow is most concentrated in the northwestern portions of the region. In North Dakota and northern Minnesota, snow water equivalents of the snowpack ranged from 6 to 10 inches, while snow depths were more than 20 inches. Map 5. 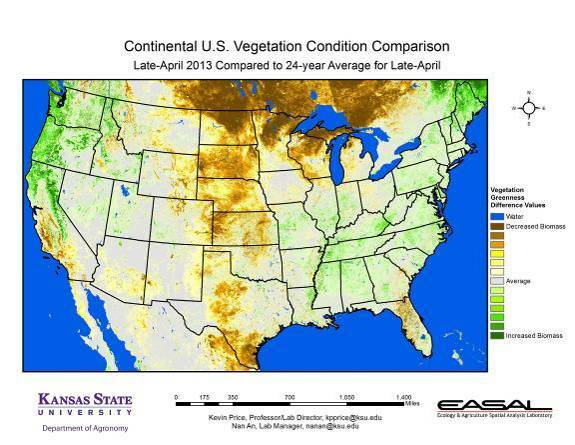 The comparison to last year in the Corn Belt for the period April 16 – 29 from K-State’s Ecology and Agriculture Spatial Analysis Laboratory shows photosynthetic activity has been much lower. Illinois and the Boot Heel of Missouri are the exceptions, and are just slightly ahead of last year’s activity. Map 6. 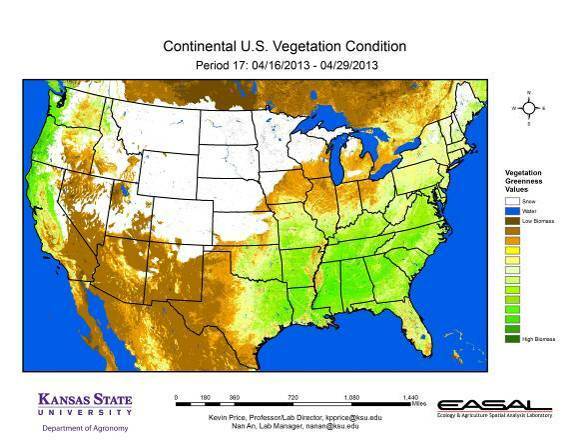 Compared to the 24-year average at this time for the Corn Belt, this year’s Vegetation Condition Report for April 16 – 29 from K-State’s Ecology and Agriculture Spatial Analysis Laboratory shows that in the area from Iowa to Pennsylvania, photosynthetic activity is at or slightly above normal. The greatest departure from average activity is in the northern areas, where temperatures continue well-below normal, and snowpack persists. Map 7. 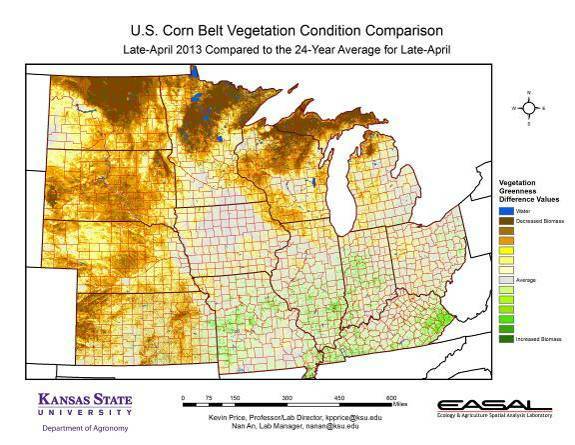 The Vegetation Condition Report for the U.S. for April 16 – 29 from K-State’s Ecology and Agriculture Spatial Analysis Laboratory shows that the Northern Plains and Northern Rockies have the greatest snow cover. Areas east of the Continental Divide have had near- or above-normal snow water equivalents, while west of the Divide and in the Southern Rockies, many areas have snow water equivalents less than half of normal. Map 8. 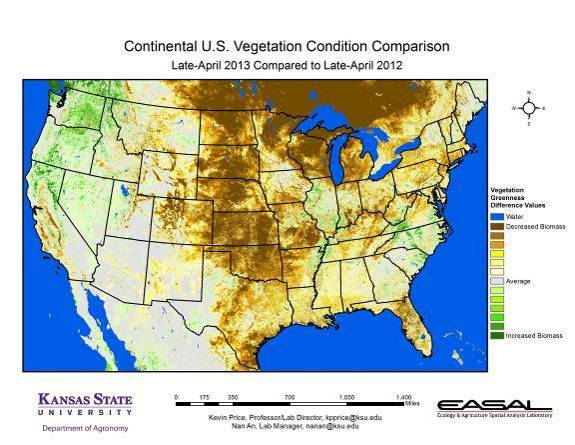 The U.S. comparison to last year at this time for the period April 16 – 29 from K-State’s Ecology and Agriculture Spatial Analysis Laboratory shows that the biggest departure can be seen in the Plains, where cold temperatures and dry conditions have provide much less favorable conditions. Cold temperatures have had the biggest impact in the northern reaches, while dry conditions have had a bigger impact in the southern regions. Map 9. The U.S. comparison to the 24-year average for the period April 16 – 29 from K-State’s Ecology and Agriculture Spatial Analysis Laboratory shows that the Pacific Northwest and Upper New England continue to have greater-than-average productivity. This is despite drier-than-average conditions in the Pacific Northwest. 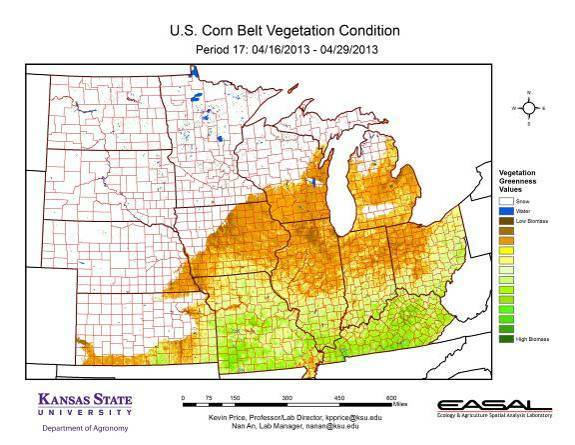 In contrast, the Central Plains region continues to have below-average productivity. Cold temperatures have delayed photosynthetic activity in the Northern Plains , as has lingering drought impacts in the South Plains.